Today is Halloween and in a city with a past as tumultuous as Berlin’s, people often wonder where the haunted places and spookiest corners around the German capital are. 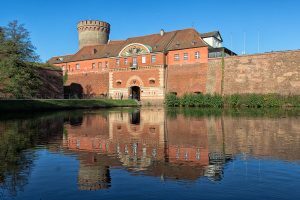 The Citadel in Spandau is an old 16th century fortress which some sentimental Berliners might tell you is still haunted by the “Weiße Frau (white lady) of Hohenzollern” today. Years before Berlin became a royal and eventually an imperial capital, it served as the official seat of the Margraviate of Brandenburg – a major principality of the Holy Roman Empire – after the House of Hohenzollern took over as prince-electors in Berlin from 1417 onward. 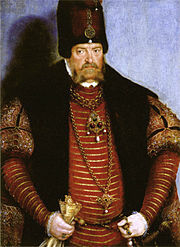 Joachim II Hector of Brandenburg served as prince-elector from 1535-1571. He was a robust leader who was concerned about the interests of his principality and was extremely generous to his servants. Not so particularly kind to his wife, however. In the same year that he became prince-elector, he married a lady from Poland named Hedwig. In 1549 she was involved in a tragic accident, severely injuring her abdomen and making it very difficult for her to walk. Joachim II consequently decided to have a relationship with a lady named Anna Sydow, who would eventually live in the Grunewald hunting lodge (which Joachim II had built) west of Berlin and gave birth to two of the Elector’s children there. Ten years before Joachim II died, he made his son, Johann Georg, promise him to protect his beloved mistress, Anna Sydow, long after he was gone. But as soon as Johann Georg came to the throne in 1571, he went against his father’s wishes and had her immediately arrested and taken to the Spandau Citadel where she was imprisoned until her death in 1575. 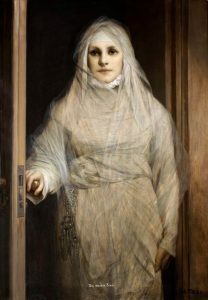 Just days before Johann Georg passed away in 1598, he supposedly saw her spirit appear to him as a “Weiße Frau” who would subsequently return to haunt the halls of the Spandau Citadel in the years thereafter. But finally in 1709, while the Berlin City Palace was being reconstructed, the skeleton assumed to be Anna Sydow’s was found. It was then given a proper burial with the hope that the Spandau Citadel would no longer be haunted. Yet according to another legend, Anna Sydow was walled in alive at the Grunewald hunting lodge, which means that the skeleton assumed to be hers in 1709 could very well have been the remains of someone else. Either way, if you happen to visit the Spandau Citadel in the future, be sure to keep your eyes open for the Weiße Frau who could still be haunting the fortress’ halls today. Happy Halloween from the Berlin Guides Association! The Berlin Guides Association is comprised of professional, expert guides working in Berlin, throughout Germany and across Europe. Our passion is sharing our knowledge of German history and culture with visitors to Berlin and from around the world. We are Berlin’s official tour guide association.